We have published it before the OpenSIPSummit2018, so, keep in mind of possible changes and releases (no need to use nightly builds anymore). Before starting to expose this post, please keep in mind that OpenSIPS project blog has a very very detailed entry, much more technical and directly from the hand of the creators 😉 We recommend reading it! On a IP flow with A(source) and B(destination) : B address is not fixed to a particular host/router/containar/virtual machine, it can be present on different elements (so, dynamic routing is a “must be present). That is, in standard unicast traffic, flow is always goes between two IP’s, in a directed way, with direct routing if they are in the same domain l2 or with indirect routing (global routing on the internet) if they are not. In the case of broadcast, it is traffic to the entire L2 domain, such as an ARP Request For or the one that surely comes to us all: the classic NetBIOS broadcast’s 😉 . When talking about anycast, it happens to come to our minds “simple” protocols such as DNS question / answer type (no state!). This is the opposite of what is SIP, where there are dialogue-transactions-record routing-contact headers- … where everything that has to do with transactions and dialogues is always important (critically important). In brief: The same IP is in different nodes / machines / environments. 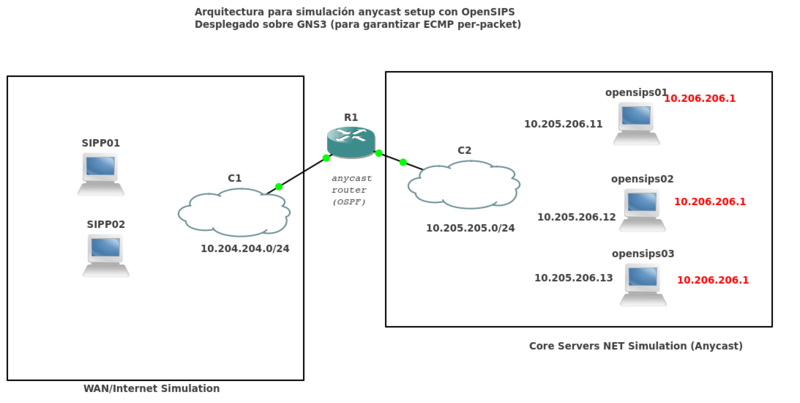 (english translation of this image: The 3 servers on the right announces (BGP or OSPF) the anycast IP 10.205.205.1/32). We want to communicate address 10.204.204.10 (on the left) with 10.206.206.1, which is not “attached” to any single component (server,router,orchestratator,proxy, blablabla … ), the IP address is “on the 3 nodes” [dot]. 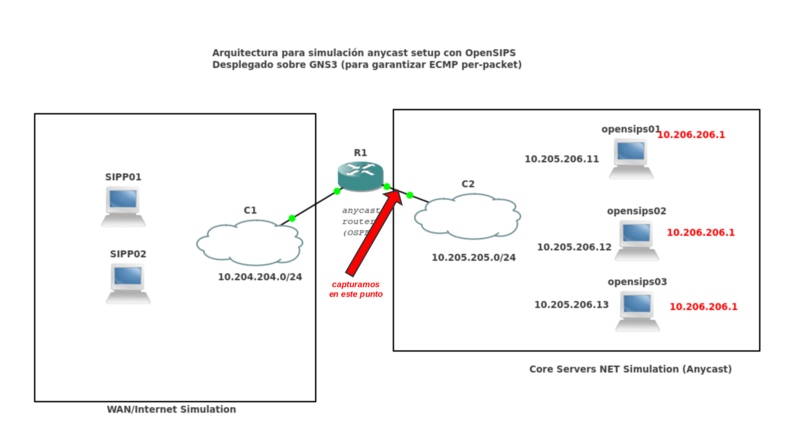 The path we take for dynamic routing is OSPF, there are other ways, but this one convinces us, given that we can scale up nodes without having to worry about BGP sessions, for what we want it fits very well. 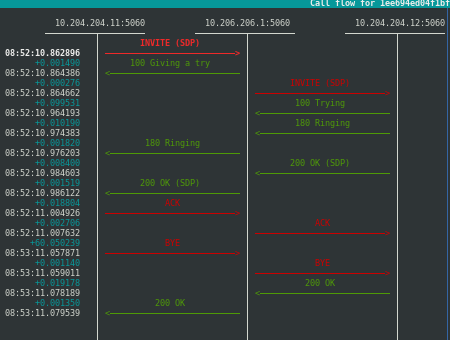 IP 10.206.206.1 is a Loopback or Dummy IP on all 3 servers. 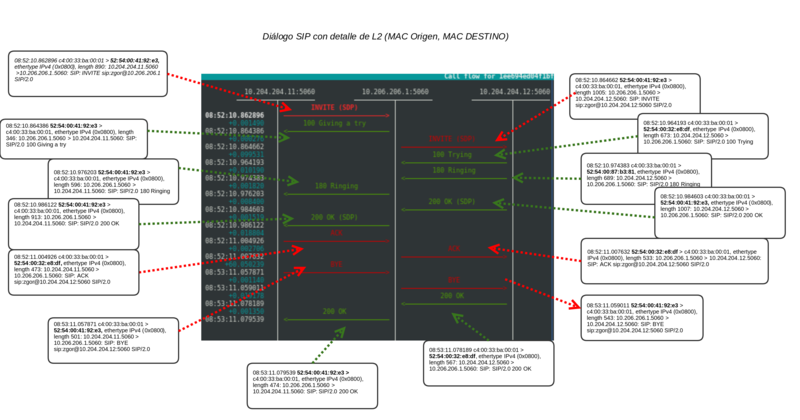 serverA # ip to add 10.206.206.1/32 dev lo serverB # ip to add 10.206.206.1/32 dev lo serverC # ip to add 10.206.206.1/32 dev lo Regarding the dynamic routing protocol that will allow us to do all this, we talk about OSPF and equal cost multipath, that is, "same cost" by several different paths. Regarding the dynamic routing protocol that will allow us to do all this, we talk about OSPF and equal cost multipath, that is, "same cost" by several different paths. ospf router ospf router-id 10.205.205.254 redistribute connected network 10.205.205.0/24 area 0.0.0.0 In little more router to add, remember to activate the ip_forwarding! In little more router to add, remember to activate the ip_forwarding! The 3 servers announce it through OSPF. PCAP or it didn’t happen! That is, between a SIP UAC 5060 UDP and 10.206.206.1 5060 UDP, the path will always be the same! 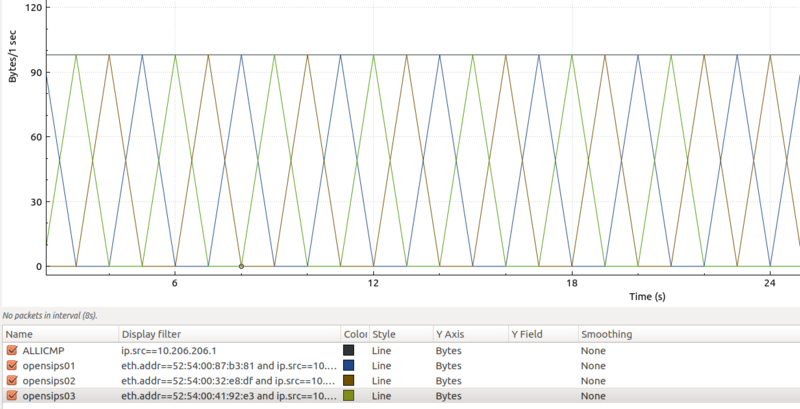 The multipath routing we have accomplished is exactly the opposite of what we are looking for in this post! 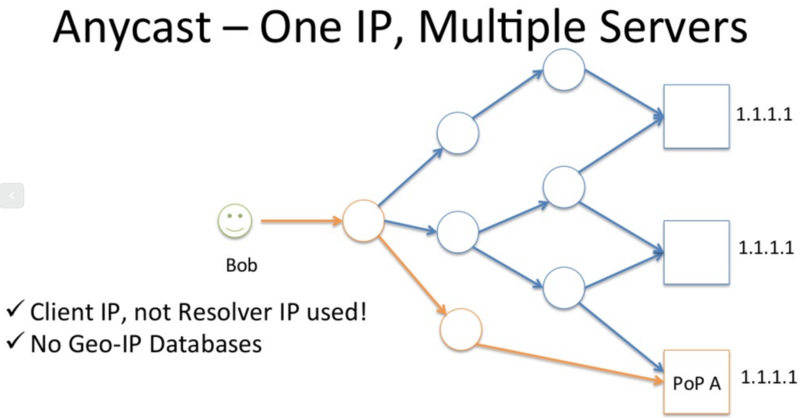 impossible to use multipath together with anycast services. interface FastEthernet0 / 0 description "Towards 10.204.204.0/24" ip address 10.204.204.254 255.255.255.0 ip load-sharing per-packet auto duplex auto speed ! FastEthernet0 / 1 interface ip address 10.205.205.254 255.255.255.0 ip load-sharing per-packet auto duplex auto speed ! We have an IP environment that allows us to do any real anycast, without balancing by flow or anything similar, that is, each IP packet (which in fact will be a SIP INVITE packet, 200 OK, etc …) is ending up in a different node. #### PROTO_BIN loadmodule "proto_bin.so" modparam ("proto_bin", "bin_port", 5566) #### CLUSTERER loadmodule "clusterer.so" modparam ("clusterer", "db_url", "mysql: // opensips:PASSSSSSSSSS;)XD@10.205.205.100/opensips") modparam ("clusterer", "current_id", 1) # Different per node! modparam ("clusterer", "current_id", 1) # Different per node! With that we have the transactions and dialogues replicated. 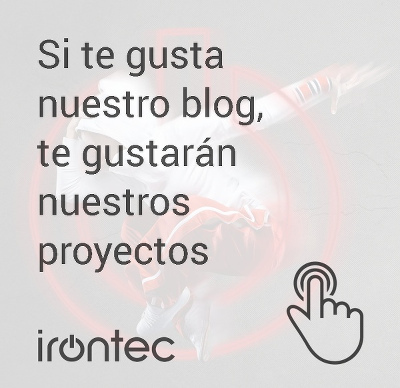 irontec @ opensips01: ~ $ cat /etc/opensips/opensips.cfg | grep server_header server_header = "Server: Opensips01" irontec @ opensips02: ~ $ cat /etc/opensips/opensips.cfg | grep server_header server_header = "Server: Opensips02" irontec @ opensips03: ~ $ cat /etc/opensips/opensips.cfg | grep server_header server_header = "Server: Opensips03"
It looks like a totally normal flow of A calls B. Then, at this stage: we have a dialog initiated with an invite transaction, which has been answered with a temporary response 1XX to finally a 200OK with its corresponding ACK; finally closed with a BYE transaction, with its corresponding 200 OK response, all sent to different OpenSIPS nodes! Yeahhhh!! Mainly, what we want to illustrate is that the destination node is physically independent, the transaction is managed correctly. If the node that receives it is not responsible for it, when it is sent by the proto_bin, it is received by the one who is (based on a tag in the header, VIA knows tb) and this one does manage it. We can send both new requests that initiate dialog and in-dialog request against different nodes, without affecting the SIP traffic. If you want to try anycast, warning with mounting it with GNU / Linux, it is not so trivial per-packet load balancing, or at least we have not found it ourselves. If it is true that with TEQL you can, but manually, we have not seen it easily deployable with Quagga / OSPF. 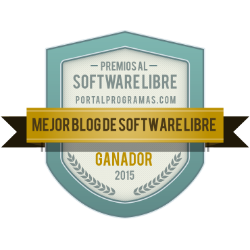 On real-life implementations of anycast (any kind of base solution), we want to highlight our partner Sarenet with their Sarevoz service, where they have been using the anycast concept for some time, working together with our beloved ExaBGP, Congratulations !